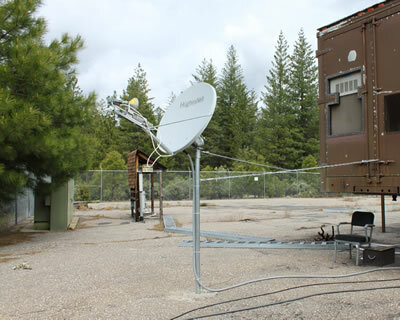 The GGN station located in Quincy, California recently went offline and a site visit was needed in order to restore its internet link. The station is accessed through the Mount Hough Ranger Station in Plumas County. The station is located on top of a hill, which can only be accessed through a locked gate which is shared with the Plumas County Repellars. The Plumas County Repellars are responsible for fighting forest fires and are dropped out of a helicopter to reach their destination. Their training facility is located a quarter of a mile below the GNSS station itself. The equipment for the station is housed in a trailer which is parked on an asphalt lot and is surrounded by a chain link fence which is accessed via authorized personnel only. The stations internet connection is provided via a HUGHES DW7000 VSAT. During this site visit, a new monitor and UPS system were installed and connected to the station computer, allowing for longer runtimes through power outages. A new cable for the VSAT system was also installed as the old one was damaged by water and corrosion. The VSAT cable was run through conduit and then run into the trailer where it was then attached to the modem. Initially the modem was not ranging correctly during the setup process and would go offline each time it finished updating its internal files and would reboot itself. After the fifth or sixth configuration attempt, with HUGHES on the phone, the modem finally sync'd it's timing with the NOC and the station once again came online. It was also noted that the pole holding the VSAT is not the correct type of pole as it can't support the weight of the dish and appeared as though it was leaning forward slightly. Chains were installed from the pole to the trailer in order to put some tension on the pole and to help it from moving. Weed killer was also sprayed in a 3 foot radius surrounding the antenna, which was beginning to blend in with the brush surrounding it.